There's plenty of interest for crime fiction fans in this week's issue of the New Zealand Listener, an award-winning weekly current affairs magazine with an acclaimed Arts & Books section. The cover story for this week's issue (dated 4-10 August, but in stores now) is an exclusive interview by Diana Wichtel with reclusive crime writer Anne Perry, who of course is more infamous in this part of the world for her earlier life as Juliet Hulme, one of the culprits in a brutal murder in Christchurch in the 1954 (which was reported around the world at the time, became known as the Parker-Hulme murder, and was later made into an Oscar-nominated film by Peter Jackson, Heavenly Creatures). Perry is about to hit the headlines again due to the release of a biography by Dr Joanne Drayton, who most recently penned an excellent biography of Dame Ngaio Marsh. 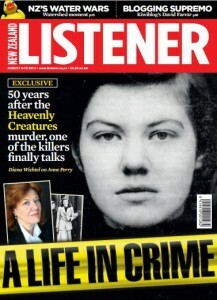 So for those in New Zealand, make sure you shoot down to your local newsagent, bookstore, or other retailer and grab a copy of this week's Listener, which also includes Ngaio Marsh Award judge Bernard Carpinter's monthly crime and thriller round-up in the Arts & Books section. For those overseas, Wichtel's interview will hopefully be able to be read online on the Listener website in 2-3 weeks. In the meantime, you can read some snippets here. Drayton will be discussing her biography in a terrific event at the upcoming The Press Christchurch Writers Festival, on Saturday, 1 September 2012 at 3.30pm. There will also be screenings of the recent documentary, Anne Perry: Interiors, during the festival. See here for the full festival calendar. Sadly, this biography on Perry doesn't tell it all. Not much of insights to the crime either...The author is very sensitive and careful not to step on any toes. And this isn't the very first time Perry talks about the murder in media. There's nothing new to discover about the case in this biography.